Teachers' Lounge - Be a Guest Professor! I have been participating in the Weekend Assignment since the summer of 2004, just a few months after John Scalzi founded the meme as part of his AOL Journals gig. Within a few weeks it became an obsession with me. Since then I have written an entry in every single Weekend Assignment, whether the topic was assigned by Scalzi or, in more recent years, by my friend Carly or myself, or by someone else. A number of you have suggested topics as "guest professors," and for this I am grateful, even if I didn't use them all. But the meme has been in decline for years, with most topics garnering from one to three entries, mine included. Coming up with fresh ideas for it, and second-guessing which ones are most likely to inspire participation, is a process that ceased to be fun for me over the last year or so. At the same time, my own life has changed dramatically in the last few months, as I've gone from working 4 to 7 hours a week to working full-time and then some. All in all, the prospect of writing the next Weekend Assignment question has become a chore instead of a game. So I'm giving it up. If anyone wants to take over this venerable meme, I will be glad to pass the torch, and help you keep it alight with announcements and promotions during the transition. I'll even do the assignments, but only as a participant. Frankly, I suspect nobody will take me up on this offer, and the Weekend Assignment will quietly die. And that's okay. It's had a good, long run, encouraged people to write, and introduced bloggers to each other. 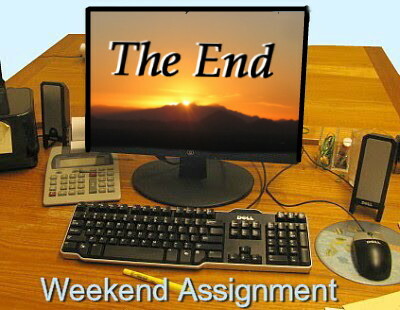 Even if there is never another Weekend Assignment topic, the meme is far from a failure overall. Its time has just passed -- or, at least, my time as its champion has passed. I will still be hosting the Round Robin Photo Challenges on another blog, and participating in Carly's Ellipsis Monday Photo Shoot. And I'm not giving up text-based blogging entirely. When I feel a rant coming on or have some news, you can expect to find me filling up a screen over at Outpost Mâvarin. When I was 24 years old, I put together my first “entertainment system”. A stereo receiver hooked up to a TV, VCR, CD player and speakers. I don’t think I even had a DVD player yet, and I certainly did not have cable. I put it all together myself and it all worked. That weekend, my brother, then age 20, came over. I dragged him to the room to brag. Not about the stuff, mind you. But the fact that I did my homework, made good consumer decisions, and put it all together by myself. He took one look and said, “This is all wrong,” and started pulling out cables. After 45 minutes or longer, we finally decided that one of us would continue to wait where we were while the other checked out the other apparently deserted parking lots at the same intersection. If I recall correctly, that was how we found Bob, and boy, was he mad! We had all been right where we had said we'd be, but missed each other in the dark, simply because it didn't occur to Bob that we might be shivering in the cold in the grocery store parking lot on the northeast corner of the intersection, not warm and safe in the bar on the southwest corner. Thanks to everyone who has ever written up a Weekend Assignment entry, or taken the time to read the entries of others. See you around! Gosh, it makes me sad to see the WA come to an end, but I guess it did live a long happy life! You did great with it, and I really enjoyed the brief time I shared the duties with you. I will always remember those times fondly! Anyway... know you did good! John was pleased to hand it over to you for good a reason, and he knows you did a great job! At the end of the day you can smile to yourself and know... YOU DID GOOD! Oh, what a shame. I really only just discovered it; have only been blogging 5 months. Congratulations on keeping it going for so long, that's a huge , huge effort. I will come and check out your other contributions. I am sorry to hear that, but understand that when it isn't fun anymore, it is time to hang it up. I am sorry that I'm not in a position to pick up the torch myself. Thank you for the ideas and the opportunity to write with such a great group. I'll see you around the Internet! Welcome! We're glad to hear from you. If you are leaving a link to your blog, please write out the whole URL, not just a live link. Thanks! This is so cool! Cant wait for the next batch! - This is so cool! Cant wait for the next batch! Josie Speaks Up . . . Weekend Assignment #311: Cheese It! Weekend Assignment #310: Create An Urban Legend! Weekend Assignment #309: Get in Line! Weekend Assignment #308: Chick Flicks Or Guy Movies? Weekend Assignment #300: Eyes or Ears?